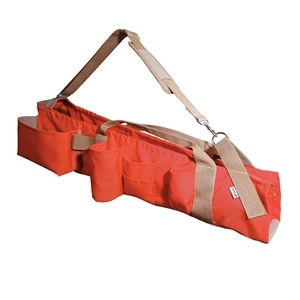 The SitePro 38-inch (96.5 cm) heavy duty lath bag is designed for purpose, durability, and with style. Constructed with high strength fiber material and tough, reinforced bottom. Bottom of bag features tough, waterproof and abrasion-resistant composite material. Designed to hold up to 50 lath or rebar, with heavy duty adjustable shoulder strap and two hand loops to carry. Large exterior pocket, paint can holder, marker pen slots, and hammer loop for added convenience.